There is growing evidence that phonics is helpful in initial literacy teaching and a growing interest in its potential for adults. However, in order to deliver phonics effectively and systematically in the classroom, training for practitioners is essential. 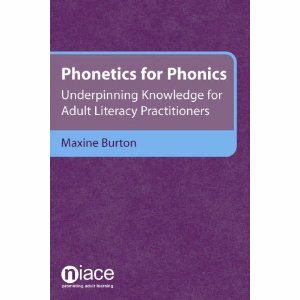 Phonetics for Phonics is a straightforward, user-friendly guide for adult literacy teachers, which is mapped to the requirements of the adult literacy core curriculum and linked with the delivery of phonics in the classroom to help teachers deliver phonics confidently and accurately in their classroom practice. Phonetics for Phonics will be of special interest to experienced, recently qualified or training adult literacy practitioners, teacher trainers, researchers in adult literacy in further and higher education, those who devise and deliver adult literacy teacher training in further and higher education, and students on general degree courses in language and literacy. « writeforward: It’s all about the Conversation!